The new purpose for this thing is for me to log my weekly progress in my PhD which officially begins on the 1st of November i.e. eight days from now. I had wanted to put writing my first post off because I had hoped that things would’ve brightened by now but the fact of the matter is that I am scared, stressed and anxious. My reasons (personal, professional, extra-curricular even) for being so are valid but it don’t improve things none. End result – I want to change my project but – for the life of me – I can’t tell if that’s because I actually want to change or if the negativity has just thrown a pall over everything. I have been told by multiple people that feeling scared about your PhD is natural given the size of the undertaking. That there are other things going on at the moment naturally exacerbates things and theses facts do make me feel less like an insane person. But fair to say, it’s not the start I’d wanted. 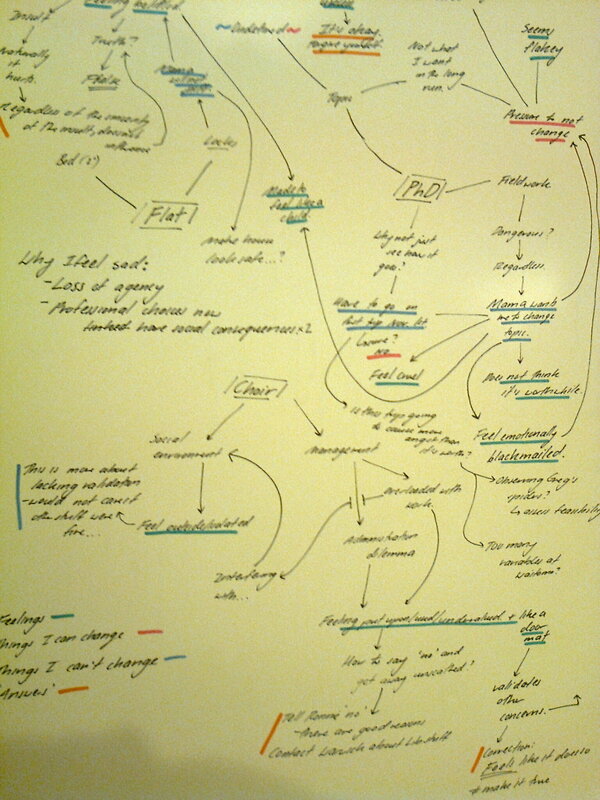 On the upside – have found a useful anxiety tool: stressor mind-mapping! Like many horror writer would tell you, the best (i.e. worst for your trousers) monsters are the ones you can’t see entirely make out. Pink for things I can change. Blue for things I can’t change. Teal for feels and orange for ‘answers’ and self-consolation. ← Natural history: out of fashion and out of time?